Bangladesh’s two leading mobile phone operators have entered into an agreement with other leading banks to expediting agent banking in the country under a revenue sharing agreement, which giving a major boost to financial inclusion. According to the report, retailers and distributors of Grameenphone and Robi which are two major mobile operator companies in Bangladesh , are serving users of the two operators will also provider service to customers on banking issues and work as the representative of the respective banks. The arrangement will be running under a profit sharing model where mobile operators and their agents will share the earnings from the banking service. Robi already has signed separate agreement with four top list banks of Bangladesh including Bank Asia, The market leader in agent banking, the service expected to be operational within a short time. Md Arfan Ali, president and managing director of Bank Asia Ltd, confirmed the partnership with the operators. He said the market needs to collaborate with each other, among government agencies, mobile operators and financial service providers, to help the country’s economic boost. ” To accelerate the financial inclusion, we are trying to bring in new products and this partnership is one of them” said Ali. 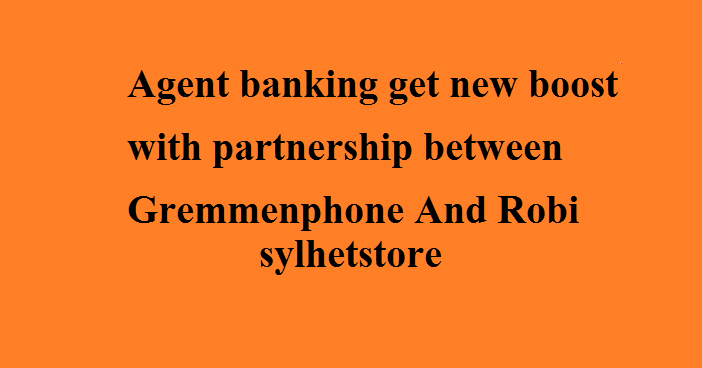 The partnership will bring the remote peoples who are not in banking network and also it’s expanding the banking network faster than ever, he added. Brac Bank’s bKash, current leader of mobile finance in Bangladesh having 30 million users and Dutch Bangla Bank Ltd’s Rockets, first mobile banking service has 10 million users, are signed an agreement to transfer money to each other account holder and to boost the economy of Bangladesh. By signing this agreement , now a user from rocket or bKash can transfer money to any one’s mobile wallet and get financial service at an easy way. Digitization has ushered in a new ground and opportunity for collaboration between the banks and the mobile operators which Robi believes, would benefit a wider consumer base of the country, said Shahed Alam, executive vice-president and head of regulatory affairs at Robi. Traditional banks face challenges to reach out to their customers. The rural customers also have to travel extensively to visit branches. Expanding and operating traditional bank branches are often not so cost-effective. Under the agent banking service, customers can have services such as cash deposit, withdrawal, remittance disbursement, small value loan disbursement and recovery of loans, as well as cash payments under the government’s social safety net programmes. The latest financial indicators of the central bank showed that agent banking is on the right track: deposit collection through the service stood at Tk 2010 crore in April-June, up 23.19 percent from a quarter ago. Grameenphone and Robi together have more than 50000 outlets across the country.